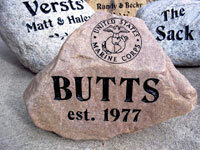 We offer custom-engraved stones, crocks, pet memorials, markers, and fund-raising bricks. We take pride in the quality of our work. We can engrave on small stones, up to large boulders around 200 pounds. The stones come in a variety of shapes and color tones. We can deeply engrave your name, a special message, a graphic design, or a simple house number. Contact us for details on sizes and prices. No two stones are alike, but we will try to acquire the perfect size or color to meet your needs. We have hundreds of fonts and designs to choose from, whether you’re looking for a touch of whimsy, or a touch of class, we can create just the right stone for your garden or drive.